On July 4, 1898, the United States Congress passed the Newlands Resolution (named after Congressman Francis Newlands), which officially annexed Hawaii. It was signed into law by President McKinley on July 7, 1898, and came into effect on August 12, 1898. 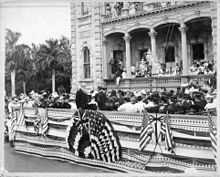 A formal ceremony was held on the steps of the formerly royal ʻIolani Palace in Honolulu where the Hawaiian flag of the Republic was lowered and the American flag of the " Stars and Stripes" raised on August 12. Former President Sanford B. Dole was appointed Hawaii's first territorial governor. The Newlands Resolution established a five-member commission to study which laws were needed in the newly organized Territory of Hawaii. 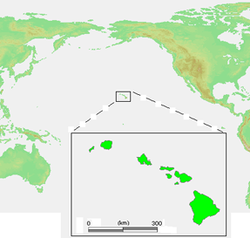 The commission included: Territorial Governor Sanford B. Dole (R-Hawaii Territory), Senators Shelby M. Cullom (R-Illinois) and John T. Morgan (D-Alabama), Representative Robert R. Hitt (R-Illinois) and former Hawaii Chief Justice and later succeeding Territorial Governor Walter F. Frear (R-Hawaii Territory). The commission's final report was submitted to Congress for a debate which lasted over a year. 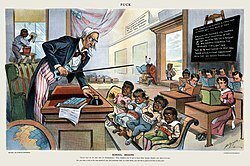 Many Congressmen and Senators raised objections that establishing an elected territorial government in Hawaii would lead to the admission of a state with a "non-white" majority in the then racist and segregated era of " Jim Crow" laws in the South at the time. From 1941 to 1944, following the attack on Pearl Harbor and America's entry into World War II, Territorial Governors Joseph B. Pointdexter and Ingram M. Stainback stripped themselves of their administrative powers by declaring martial law. With the territorial constitution suspended, the legislature and supreme court were also dissolved indefinitely. 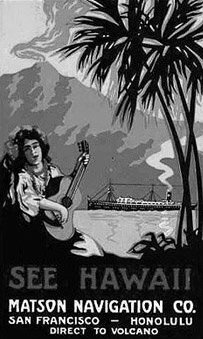 Military law was enforced on all residents of Hawaii. The formation of the military government was mostly done by Maj. Gen. Thomas H. Green of the U.S Army Judge Advocate General's Corps, who became Military Attorney General. General Walter Short appointed himself military governor December 7, 1941. He assumed control of Hawaii and governed from ʻIolani Palace, which was quickly barricaded and fitted with trenches. He was relieved December 17 and charged with dereliction of duty, accused of making poor preparations in case of attack before the attack on Pearl Harbor. Anthony, the shadow Attorney General of the period, provides different information. The "aged and weak"  Poindexter (sic), an appointed Democrat, was variously misled into surrendering his powers. Anthony does not mention fingerprinting; corroborates gasoline rationing but not food (the latter unlike the mainland); and disproves a liquor ban by showing how the military gained handsome profits by liquor permits and fees. The Glockner and Seifert cases, actually two detained, naturalized Germans, tested the military's suspension of habeas corpus. In the second year of martial law, August 1943, U.S. District Judge Metzger subpoenaed General Richardson as to why these two were held without charges. The General, according to General Order No. 31, could have had the server arrested for bringing charges against a military person, but instead had the Marshal manhandled so as to evade summons. The prisoners were released outside of Hawaii, avoiding the implicated fall of military power. A former officer of the Honolulu Police Department, John A. Burns, was elected Hawaii’s delegate to Congress in 1956. A Democrat, Burns won without the white vote but rather with the overwhelming support of Japanese and Filipinos in Hawaii. His election proved pivotal to the statehood movement. Upon arriving in Washington, D.C., Burns began making key political maneuvers by winning over allies among Congressional leaders and state governors. Burns’ most important accomplishment was convincing Senate Majority Leader Lyndon B. Johnson (D-Texas) that Hawaii was ready to become a state, despite the continuing opposition of such Deep Southerners as James Eastland  and John Sparkman. In March 1959, both houses of Congress passed the Hawaii Admission Act and U.S. President Dwight D. Eisenhower signed it into law. On June 27, 1959, a plebiscite was held asking Hawaii residents to vote on accepting the statehood bill. The plebiscite passed overwhelmingly, with 94.3% voting in favor. On August 21, church bells throughout Honolulu were rung upon the proclamation that Hawaii was finally a US state.